In Slate earlier this week, Jillian Keenan argued that we should “kick Andrew Jackson off the $20 bill.” As this “coffin handbill,” distributed during the 1828 election, shows, the seventh president has long inspired such violent dislike. “He has ever been a man of ‘blood and carnage,’ ” the Philadelphia editor John Binns, who printed and distributed the handbill, writes. In small print, the broadside collected several instances of Jackson’s alleged perfidy, recounting the story of an 1815 execution of six militiamen for desertion during the War of 1812; pointing to the killing of Indian noncombatants during the 1814 Battle of Horseshoe Bend; and reprinting personal testimony from Sen. Thomas Hart Benton about an altercation he had with Jackson in a Nashville-boarding house. The anecdote on the right-hand side of the handbill, illustrated with two figures (one bent over, one looming), recounted an 1806 incident in which Jackson quarreled with Samuel Dorsey Jackson (no relation) on a Nashville street. According to historian Mark Cheathem, Samuel Jackson said that he bent over to find a rock with which to defend himself, at which point the future President ran him through with his sword cane (a weapon disguised inside a walking stick). Jackson won the election, allegations notwithstanding. 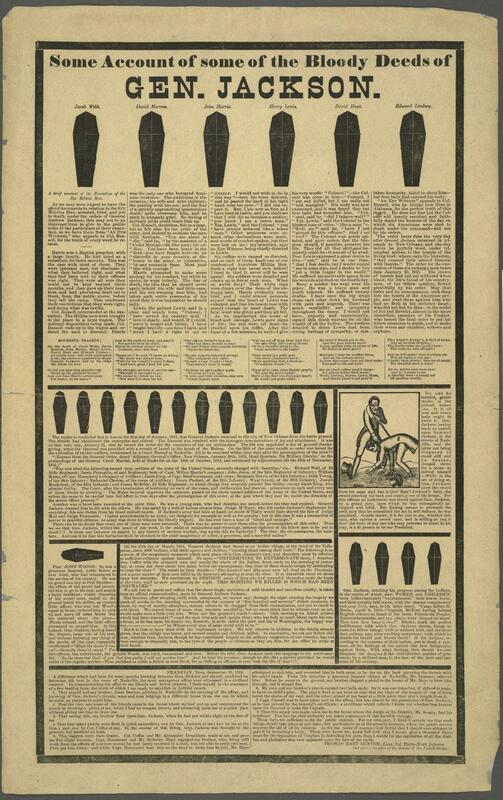 As researcher Lydia Blackmore writes, the coffin handbill became an iconic artifact of 19th-century political culture, being reproduced and sold several times throughout the century as a commemorative curiosity. Click on the image below to arrive at a zoomable version, hosted in the Cornell University Library digital collections.